(Note: We’re repeating this post for Presidents’ Day. It originally appeared on May 13, 2011. 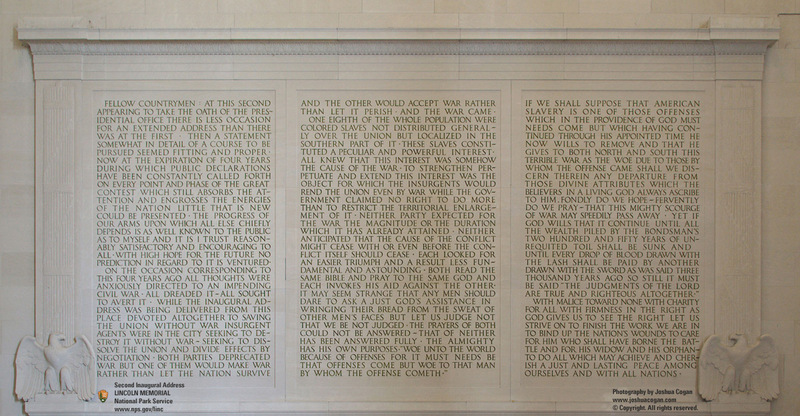 Q: On a recent visit to the Lincoln Memorial in DC, I noticed that there were no commas in the Second Inaugural Address carved into the wall. There are dashes and periods, but no other punctuation. Did writers of the time not use commas? A: Lincoln’s Second Inaugural Address has plenty of punctuation—commas, semicolons, periods, and dashes. You can see images of Lincoln’s manuscript of the speech, in his own handwriting, at the Library of Congress website. Of course, mid-19th-century prose had a lot more semicolons than we use today. When the speech is reproduced these days, the punctuation is usually somewhat simpler, with commas replacing the semicolons. But the version engraved at the Lincoln Memorial is simpler still. Both the Second Inaugural and the Gettysburg Address are engraved at the site in their entirety. And, as is usual with public memorials, the engravers have done their best to make the writing unreadable. The speeches are rendered in all capital letters, with paragraph indentations barely visible and punctuation reduced to a minimum. The website of the National Parks Service has an image of the speech as engraved. See what we mean? The stone inscription certainly doesn’t invite readers in, to say the least. And that’s too bad. The Second Inaugural is one of the most powerful and stirring speeches in our history. Lincoln delivered it on March 4, 1865, during the final days of the Civil War. Little over a month later, he was assassinated.